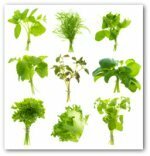 Vegetable Garden Irrigation: How Much and How Often? 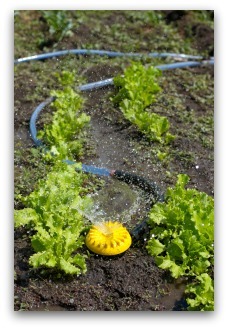 Vegetable garden irrigation tips and plans; how often and how much do you need to water your vegetable garden? When is the best time to water a garden? Healthy gardens need adequate water, time for the foliage to dry out, and good drainage in order to flourish. Are you planning to install a drip irrigation system, or will you be using a sprinkler, hose, or watering can? 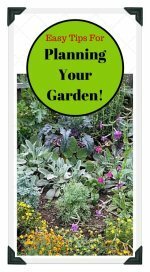 All of these methods will work for your vegetable garden depending on how large it is. However, hand-watering can be rather time-consuming when tending a large garden! Container gardens are easy to water by hand with a hose or watering can if you will be home every day. Container gardens are especially vulnerable to drying out quickly during very hot or warm windy weather. A drip system on a timer works well if you will not be home each day to do the watering yourself. It is not difficult to install a drip system if you are at all handy with basic do-it-yourself projects. A single small to medium-size raised bed vegetable garden can be watered by hand fairly easily with a hose with a watering attachment. It can also be watered with a lawn or garden sprinkler, or drip system. Whether you amend your garden soil by double digging or with a tiller, be sure to rake the plot thoroughly after you are finished. Remove any rocks and break up any remaining clumps of dirt. Raking smooths the surface and levels the ground, which aids in water retention. Leveling a garden site before planting saves you extra steps from possibly needing to build terraces later to correct drainage problems. 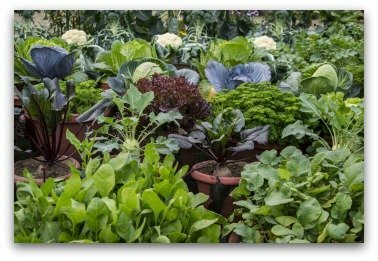 Permanent watering systems make caring for a vegetable garden easier by ensuring that plants receive adequate moisture according to a programmed schedule. Installing an in-ground vegetable garden irrigation system requires only basic tools and is surprisingly easy to do. 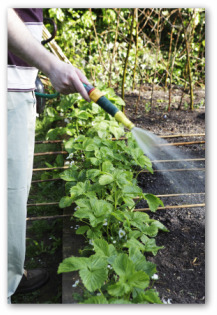 Plan your vegetable garden irrigation carefully by using all the helpful information offered online and at your local hardware store or garden center. Allow for any future expansion plans you may have for your garden site. Follow the simple guidelines below on how to install automatic irrigation in your vegetable garden. • From your water supply line and backflow prevention valve, trench and run 1 inch PVC pipe. Schedule 40 pipe to control valve location. Install a ¾ inch reducing bushing at the valve. Mount control valves below grade where freezing temperatures are likely. • Install a separate control valve for each water circuit. Between each valve and the lines running to the drip emitters or sprinkler heads, use a ½ inch reducing bushing. • Using a PVC pipe-cutting tool, cut pipe to length. Then join sections using adhesive and a two-step primer. Allow glue to dry at least 24 hours. • Where each irrigation head is planned, install a 90 degree ell fitting, with a threaded coupler to the riser and slip joints to the pipe. • Install drip-system hose couplers or sprinkler spray housing atop each riser. Use Teflon tape around each threaded fitting. • Turn on the gate valve and sprinkler manifold to clear line of debris. Then turn off and install spray heads and drip lines. How Much to Water Your Garden? 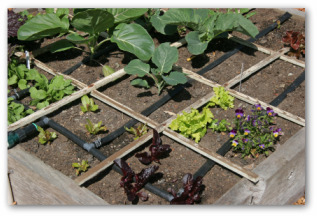 The green rule of thumb is to supply an inch of water to the vegetable garden soil with each irrigation. Water less if your soil is clay-like or dense. Avoid over-watering that creates a runoff. Good vegetables gardening practices mean conserving water. With an in-ground vegetable garden irrigation system, you can adjust the amount of time and the flow to suit your garden‘s watering needs. Always adjust the system to supply more water as outside temperatures climb. When your vegetable garden has grown taller, stand your sprinkler on a platform or riser so that the water will go over the garden. This will help insure that all the plants receive adequate water. 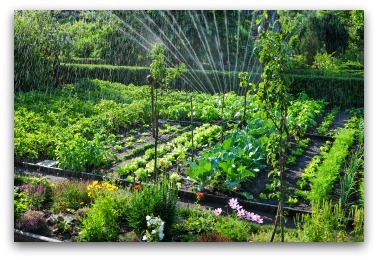 Irrigate for 20-30 minutes per day during hot weather, allowing water to completely penetrate the soil. When you believe you have watered the garden bed sufficiently, test the soil. 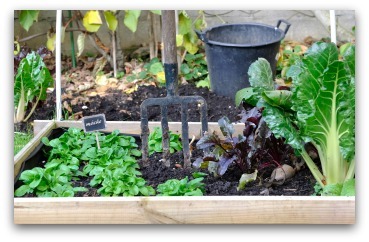 Dig some earth from the area close to your vegetable plants, to the depth of the roots. If the subsurface is dry, continue watering until it is uniformly wet to a depth of 4 inches. 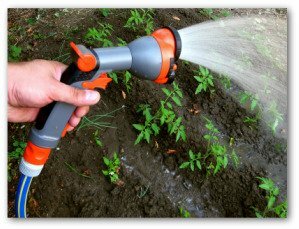 If your garden is fairly small, or if you just love watering your garden by hand, a hose with a watering wand attachment works great! Just be sure that you have an attachment with a gentle 'shower' setting; you don't want to blast your little plants to smithereens! 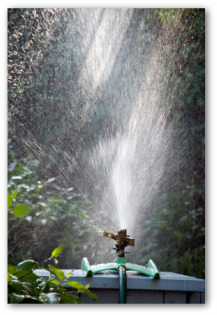 If you water with hoses or watering cans, times of drought and heat must be tackled with more frequent watering. 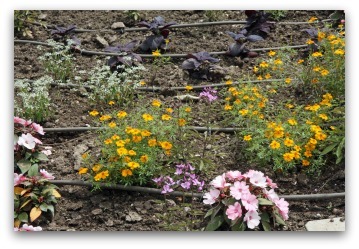 Whichever method you use for vegetable garden irrigation, check the soil every few days. Adjust the watering patterns according to the differing impact of heat spells or rainy periods. 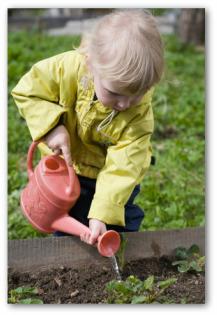 If you have a small garden or a container garden, a watering can works well for watering your garden. Most watering cans have an attachment that provides for a gentle shower of water. This is the safest option, as plants can be damaged, and soil can be dislodged, by a forceful stream of water from a hose or watering can. If you do not have a source of water near your garden, you can store water in plastic milk jugs near your garden. However, it is best to use the milk jugs to fill your watering can, as watering directly from the jugs is difficult without damaging your plants, or washing the soil away from the plant roots.